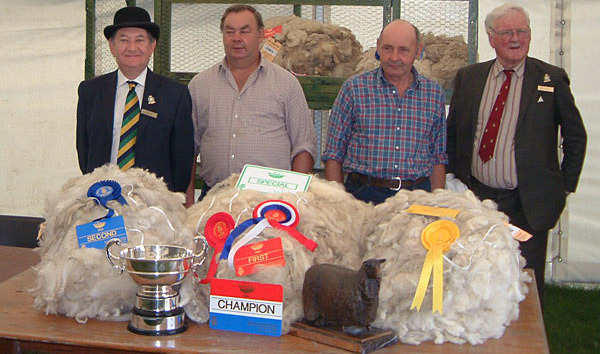 Champion Fleece, Any Other Breed, Great Yorkshire Show (Border Leicester), exhibited by Mrs. E. Stokeld. Every year we have Border leicester fleeces available for sale to spinners/felters and crocheters. We ship all over the world. To date our fleeces have gone to the States, Canada, The Netherlands, France, Italy, Germany, Denmark,Sweden, Finland and Switzerland. The Borderleicester fleece is a very versatile fleece with it's long semi lustrous staple, it's never ending crimp, softness and strength. We shear our shearling ewes and rams in end of May /June. Our senior ewes and rams then get sheared round about June/July. 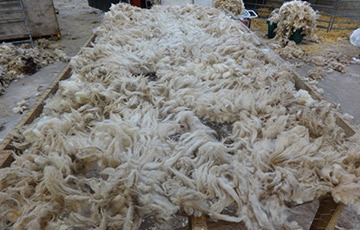 Fleeces of Border Leicester rams are between 3.5 and 7 kgs with female Border Leicester fleeces between 2.5 to 4 kgs. They are very lustrous with a superb crimp and good length staple and colour.They have a grade of 48/50 Bradford (29-32 micron). 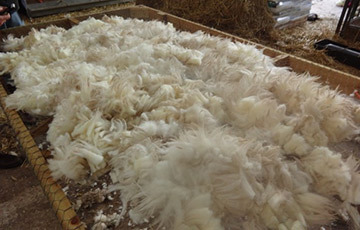 Here are pictures of one of our lamb fleeces and a shearling fleece from last year laid out on our skirting table. The lamb fleece is so soft and white and very crimped. 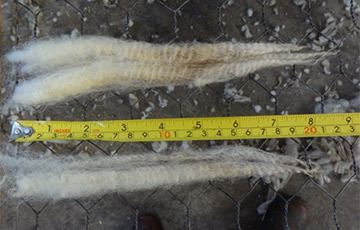 The shearling ewe fleece is so beautiful with such long crimped staples. So beautiful!